Sanjay Minocha was born and raised in Victoria, Texas, the son of Indian immigrants. He headed to New York City for college, where he earned a Bachelor’s degree from Columbia University. Though he loved the thrill of NYC, Sanjay missed his home and the best state in the country. 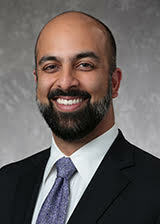 Sanjay returned to Texas to attend and graduate from the University of Houston Law Center. While there he worked for U.S. District Court Judge Gray Miller, the Federal Public Defender for the Southern District of Texas, and two prominent Houston firms. Sanjay edited the Houston Journal of International Law and participated in mock trial competitions. He also has clerked with the Dallas County Public Defender. After school, Sanjay began his career as a trial lawyer at a prominent Houston law firm, where he represented companies and individuals in high-stakes business litigation. He later moved to Dallas with his wife to be closer to her family. Sanjay continued practicing civil litigation for several years at a well-respected downtown firm. After years of honing his litigation skills, Sanjay opened Minocha Law Firm PLLC in order to expand his practice to defend people accused of crimes. Sanjay fights for the rights of individuals against a stacked system. Sanjay is proud to say he has never worked for the DA’s office and has fought the State at every turn. Sanjay Minocha is here to be your lawyer and advisor—no matter the problem. He has years of experience trying criminal and civil cases in courts all over Texas and is admitted to every federal district in Texas. Sanjay’s colleagues know him as a dedicated, intelligent, and ethical lawyer, willing to work hard to help put his clients in the best possible position even in dire circumstances. At Minocha Law Firm, you will not just be a number—Sanjay takes the time to get to know each of his clients and guide them through life’s toughest situations. You can find Sanjay’s full resume here at LinkedIn. Minocha Law Firm PLLC presents the information on this web site as a service to its visitors and other Internet users. While the information on this site is about legal issues, it is not legal advice. This web site is designed for general information only. The information presented at this site should not be construed to be formal legal advice nor the formation of an attorney/client relationship. Moreover, due to the rapidly changing nature of the law and the reliance on information provided by outside sources, we make no warranty or guarantee concerning the accuracy or reliability of the content at this site or at other sites to which we link. Unless otherwise indicated, attorneys listed in this site are not certified by the Texas Board of Legal Specialization.